I used to practice pediatrics. It has been several years since I decided to leave medicine, but people still ask me about it, and I find myself offering neat explanations between gulps of coffee. Of course, the full truth is much more complicated. The full truth has as much to do with our health care system and our culture as it does with me. My journey in pediatrics was not entirely typical. I went through Georgetown University’s medical school on a Navy scholarship, which meant that, unlike most of my peers, I spent my formative years as a pediatrician practicing under a system of universal health coverage in the U.S. military. All patients – admirals’ sons as well as the stepchild of a seaman apprentice – received excellent care. Doctors were well paid, and the standards and quality of care were as high as I have observed anywhere. No money exchanged hands: Just show your card and you were in. Fast forward ten years and I was in a thriving private practice in suburban Rhode Island, along with several other dedicated, highly trained pediatricians, and an army of nurses. I quickly learned how methods of reimbursement shape the way doctors practice. Private insurance companies decide who gets paid for what, so pediatricians treat serious mental illness with little psychiatric training, use nebulous tools to diagnose attention deficit disorders, and valiantly tilt at the windmill of childhood obesity not because we can do this most effectively, but because we are the only professionals who can get paid to do so. At the other end of the treatment spectrum, free market forces often urge us to over-intervene with minor illness, where less really would be more. For example as baby spit up acquired more syllables, expensive medications to treat infant gastroesophageal reflux earned full page glossy ads in parenting magazines, pharmaceutical industries poured tons of money into self-serving clinical studies, and prescriptions flew off our pads. The economics of health care trickled down into my exam room, into the conversation between doctor and patient, distorting the relationship. Most of my patients, children of the “worried well,” had self-limited illnesses that would get better without any intervention from me. I had to explain again and again to frustrated parents, who had just shelled out a $25 copay, why their child didn’t need antibiotics – or any other medicine – for a cold. I met skepticism, even hostility, as I explained for the hundredth time why a 3 AM earache wouldn’t improve with a visit to the emergency room. “Do you know how much I pay in health premiums?” parents would ask. Our system of paying for health care and the stresses on today’s families were pitting my best medical judgment for the child against all the other worries and desires of the parents. I like most of my colleagues, valiantly stepped up to the plate and kept on swinging, even as I was being pulled farther and farther from the doctor I was trained to be. I did my part to put a scientific spin on our highly subjective approach to learning disorders. I patiently played along with obsessive discussions on toilet training without acknowledging the toll such indulgence took on precious health care dollars, as I tried to meet the ever-expanding expectations of the “worried well.” I taught myself as much as I could about mood-altering drugs so that my depressed patients, denied appropriate access to psychiatrists, would have some one to turn to. In short, I helped put the “dys” in dysfunctional. In the end I just got tired. Literally. At forty-six years old, being up all night and working the next day left me physically ill. Meanwhile, my own two teenage daughters were spending too many nights at home alone while both their parents tended to patients. So when I was unexpectedly presented with a way out – the chance to teach chemistry at an all-girls’ high school – I took it. It was a painful, difficult choice, but it was the best decision for me and my family. I have hope for my profession. I believe our society will eventually see the economic sense and moral imperative of universal health care coverage, paving the way for healthcare to be designed by health professionals, and to be viewed as a right and a responsibility, rather than a commodity to be purchased. I believe that pediatrics can evolve, too, in a way that will truly meet our society’s health needs. We will always need pediatricians to understand and cope with complex or dangerous illness. We will also need trained health care providers, like pediatric nurse practitioners, to deliver competent, less expensive care for health maintenance and minor illness. Pediatricians in turn will need to be trained in how to support those practitioners. Finally, in an age when public health issues like obesity are what pose the greatest threats to our children, pediatricians will need to move out of the confines of the fee-for-service exam room to advocate for effective healthcare policy in the wider community. This shift in how we focus and pay for pediatric expertise will be challenging, but I know there is a whole new generation of young students out there who will be up to the task, and a new generation of children counting on us. Nice piece although I am not in complete agreement with your conclusion.Your depiction of life as a working doctor struck a chord though. 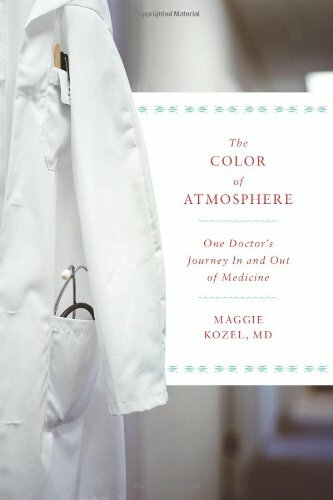 I just read about your upcoming book on the site “Women Leaving Medicine” I am very interested to read it. I too left medicine just over three years ago for alot of the reasons you mention in this blog. I am currently not working outside of the home. I am now a full time mom of four. I constantly struggle with the guilt of not using my education but I was not happy and my family suffered. I would love it if I was presented with the opportunity to teach as you were. I’m sure teaching has many struggles as well but I think I would like it at least I think I would like to try. I am glad that I have found your blog and will follow with interest. Thanks. I can relate to how agonizing your decision must have been. I also know that doctors are a smart, resilient and resourceful bunch. I imagine you will find ways to use your talents and training, and I wish you luck. I am glad if hearing my story has helped. Excellent, true but sad posting. I am old enough to remember when most physicians were male. It is sad to hear that physicians, especially women, are leaving the field so young. Many nurses are also fed up. Many new nurses are leaving the field too soon also. I wish our fellow Americans that do not believe in universal health care could walk a day in my shoes. People are dying or at the minimum suffering. People are going bankrupt. It is fine to sit at home in your comfy home and hear these stories. It is quite a different thing to live it real life. It hurts and leads to burn out. Burn out, because you wonder, how we could treat each other this way. With a forecasted shortage of doctors it is a crime to waste limited medical school seats on those who did not take the time to fully consider the stresses of life as a doctor combined with family life. One can tackle important issues such as obesity with public health degrees so that we can increase the number of practicing doctors. Concept of a Statistician: A person who believes figures don’t lie, but admits than under analysis some of them won’t remain true either. High achievement always occurs inside framework of high expectation.